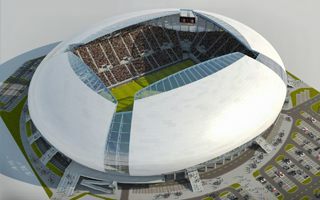 During its Monday meeting, the Romanian government approved funding for the Complex Sportiv Ion Oblemenco. New home for re-established Universitatea Craiova will be built by the Ministry of Regional Development. Entire project should cost €55 million ($67m), of which the Ministry will provide nearly 50 million or 90%. Remainder is to be supplied by local authorities, who are expected to build a secondary stadium for 5,000 people, with running track. The main venue, able to hold over 30,000 viewers, will be football/rugby-specific. Construction tender is already underway and works may begin in spring. If so, they are expected to end in 24 months, both design and on-site proceedings.